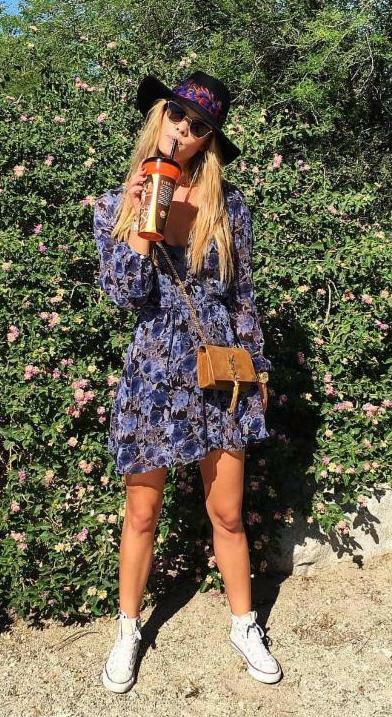 Nina Agdal wore Chan Luu this weekend at Desert Trip in Indio, CA. The supermodel posted a cute Instagram pic wearing her Chan Luu Black Mix Floral Print Wrap Dress ($238 www.chanluu.com). Nina Agdal is a Danish model. Agdal is signed with Elite Model Management. She grew up in Hillerød, Denmark, and has modeled for Billabong, Victoria's Secret, Bebe Stores and Calzedonia. She has also been in fashion editorials for Vogue Mexico, Elle, Cosmopolitan and CR fashion book by Carine Roitfeld. In 2012, she made her first appearance in the Sports Illustrated Swimsuit Issue and was subsequently named the issue's "Rookie of the Year". In 2014, she appeared on the 50th anniversary cover of the Sports Illustrated Swimsuit Issue with Chrissy Teigen and Lily Aldridge. Chan Luu is a Los Angeles based contemporary lifestyle brand offering handcrafted jewelry, scarf and apparel products. Chan Luu designs combine cultural elements found worldwide with a modern California influence to create the signature Chan Luu style. Their products are made with high quality materials and are handcrafted to achieve a natural look and feel. Born and raised in South Vietnam, in a sea-side town called Nha Trang, Chan had a passion for designing at a very young age. She recalls gathering seashells from along the shore and spending hours handcrafting one-of-a-kind pieces of jewelry for herself and friends. Her company has also ventured into fashion.